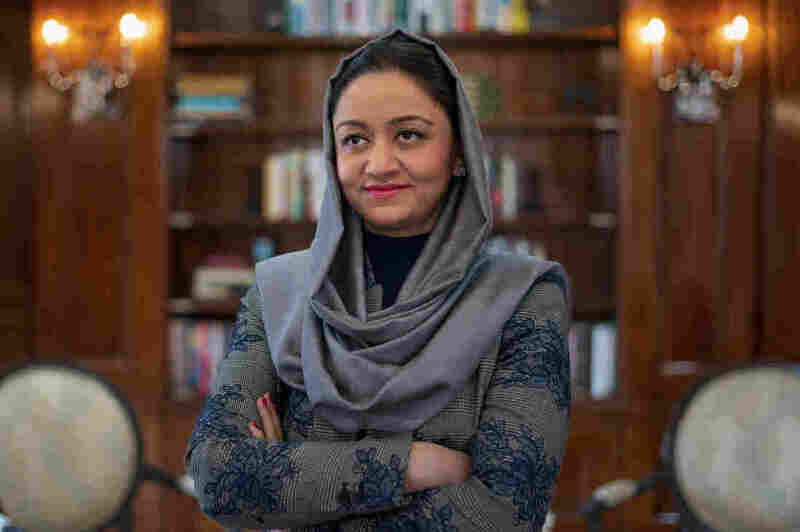 Afghan Ambassador Roya Rahmani: 'We Will Not Be Going Back To The Time Prior To 2001' Roya Rahmani is Afghanistan's first woman ambassador to the U.S. "What makes me hopeful about women's rights in Afghanistan is that women themselves, they have their own voice," she tells NPR. 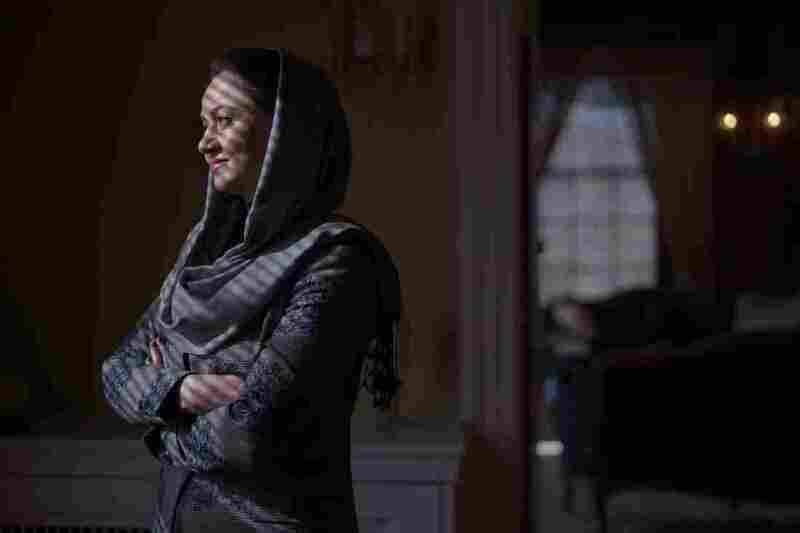 "What makes me hopeful about women's rights in Afghanistan is that women themselves, they have their own voice," Roya Rahmani, Afghanistan's ambassador to the U.S., tells NPR. When Roya Rahmani became Afghanistan's first woman ambassador to the United States on Dec. 14, 2018, the U.S. was at the start of its 18th year of war in her country. Afghan army soldiers were dying at "unsustainable" rates. Meanwhile, the Taliban continue to launch deadly attacks and take territory. The Trump administration announced plans in December to begin withdrawing about 7,000 troops from Afghanistan. In his State of the Union address, the president said he had "accelerated" U.S. talks, aiming for a reduction in U.S. troop presence. Peace negotiations have been taking place between the Taliban and Afghan opposition leaders and a team led by U.S. Special Representative for Afghanistan Reconciliation Zalmay Khalilzad — but so far, the government that Rahmani represents has been shut out. The Taliban refuse to negotiate directly with it. To this day, it is not a party to talks on the future of the country it leads. Rahmani, 40, who previously served as Afghanistan's ambassador to Indonesia and the Association of Southeast Asian Nations, prefers to talk about the positives when it comes to that future. "We have such a high level of resilience ... and every time, we have come out stronger and better," she tells NPR in an interview at the Afghan embassy. "Of course, huge sacrifices have been [made] on the way. And unfortunately, we have lost so many of our dear countrymen and women, and children." But, she says, "I am positive that things will move towards better. And I want to say to all of my people that they can play a role in shaping their destiny. With our unity and resilience, we will [get] through." It became like a mission in my life that if I could do anything, anything, to stop a bomb from going off and killing people, or even a person, if I could do that, my mission in life is completed. Roya Rahmani, Afghanistan's ambassador to the U.S.
Afghanistan has come too far in the last 17 years to regress, she emphasizes. Starting in 2002, opportunities for women began to blossom after years of repression under Taliban rule, when they were barred from most education and work opportunities. Now, around 3.5 million Afghan girls are enrolled in schools and one-third of Afghan university students are women. "What makes me hopeful about women's rights in Afghanistan is that women themselves, they have their own voice," Rahmani says. "They have their ability to be part of the public. ... There is a huge shift in this regard ... and that's what gives me hope and I believe that we will not be going back to the time prior to 2001." Rahmani was born in Kabul in 1978, a year before Soviet troops invaded Afghanistan. "I believed as a little girl that [Kabul] was the most beautiful city in the world, that Afghanistan was the best country in the world," she tells NPR. She remembers the fragrance of tulips and daisies seeping into the city, each flower signaling a change: the start of the school year, exams, summer vacation. Kabul was spared from much of the violence of the Soviet war, but after Soviet troops pulled out of Afghanistan in 1989, the country descended into civil war and attacks by mujahideen factions shook the city. Her school was closed for months at a time. Rahmani recalls the sound of missiles growing louder and hearing constant questions: "How many injured? How many dead?" Her family fled in 1993. Like millions of other Afghans, they lived as refugees in neighboring Pakistan. Rahmani attended a Saudi-funded school for refugees in Peshawar. When the classrooms overflowed with students, she recalls studying on the roof for an entire school year. "As an Afghan woman, very early on, like the rest of my cohort, we learned that you have to try to make the best out of what you have," she says. "So uncertainty was what dominated most of our lives." 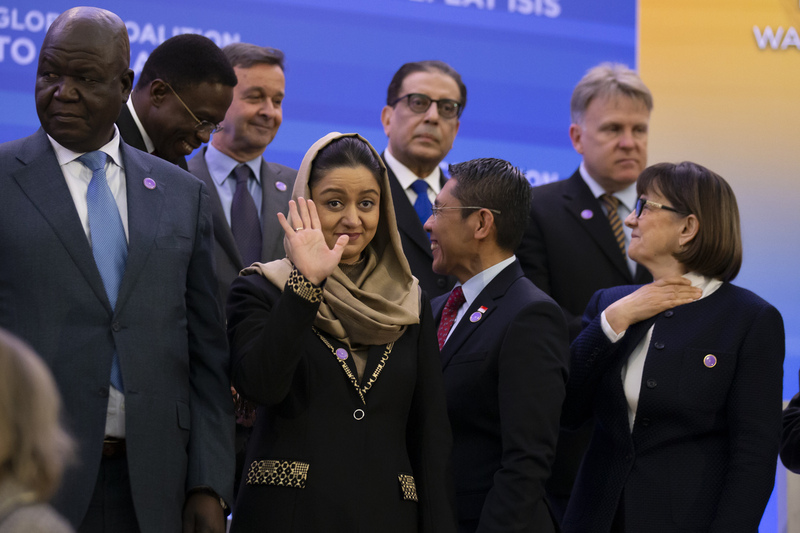 Afghan Ambassador to the U.S. Roya Rahmani waves with other officials during the Global Coalition to Defeat ISIS meeting, at the State Department on Feb. 6. She decided early on "to be independent," she says. "I always felt that I do not want to be a dependent person when I grow up, and that has been a very big and propelling factor in my life." In 1998, after her grandmother died, Rahmani returned to visit Kabul with her family. She found a gloomy, deserted and stagnant city under Taliban rule. For the first time, she saw her mother in a burqa, which the Taliban required women to wear. Rahmani has said she refused to leave the house rather than put one on. The following year, on a scholarship from the World University Service of Canada, she enrolled at McGill University and received a bachelor's in software engineering. She returned to Afghanistan in 2004, working for a Canadian nonprofit dedicated to Afghan women's education. At the time, violence against civilians and U.S. troops surged. Roya Rahmani, who served previously as Afghanistan's ambassador to Indonesia and the Association of Southeast Asian Nations, is the first woman to be named her country's ambassador to the United States. "And to me, it has been always, a human life is a world by itself," she says. "And these worlds were reduced to a number." She was determined to make a difference. "It became like a mission in my life that if I could do anything, anything, to stop a bomb from going off and killing people, or even a person, if I could do that, my mission in life is completed." Rahmani continued working for international nonprofits, often focusing on human rights, and then left for New York City to attend graduate school at Columbia University, where she received a master's in public administration and international law in 2009. Two years later, she joined the Afghan government, the first in her family to do so. She worked in the education ministry and then the Ministry of Foreign Affairs. She's now one of four Afghan women ambassadors, she says; about 20 percent of Afghanistan's foreign service is female. The stakes for the next generation of Afghan women are personal for her. She has a 4-year-old daughter. "So yes," she says, "I want my daughter to grow in a country where she could live as a girl, child, happily and peacefully, again without fear, filled with hope and then not feel nervous about being a girl [and] feel that her presence in the public sphere is as welcomed and accepted as it is anywhere else. That she has the possibilities to explore her interest and talent and happily live." One of her great wishes, Rahmani says, "is that my daughter would be able to read and understand and connect with poetry. Because in our culture, poetry is a very important aspect of it." Rahmani remembers being struck by "Free Tulip," a poem she read in elementary school by Ebrahim Safa, an Afghan poet, journalist, translator and activist born more than a century ago in Kabul. "It's the best reflection of my own existence and life," she says. The tulips in Kabul would grow wild, Rahmani says. "So they grow and then they vanish by themselves, so the poem is about this, this whole cycle of this. And then it says, 'I am free to live.' ... So basically, [the poem] says that in the garden that day, the garden space is too tight for me. So I have such a free spirit that I grow in deserts."